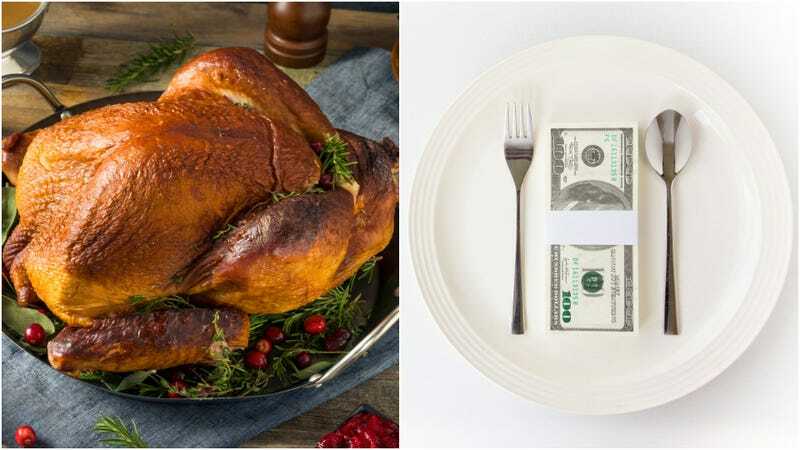 In lieu of this $150K Thanksgiving dinner, maybe we should just eat the rich? Thanksgiving is my favorite holiday. You think I wanted to be spitting-cat mad today? You think I wanted to be fuming about the grotesqueries of our society while defiantly wearing sweatpants and thinking about making avocado toast I definitely won’t actually make because that would involve going to the store and also then I’ll never own a home? Yet here we are. Thanks, Old Homestead steakhouse and Yahoo! Finance reporter Zack Guzman. Thanks a lot. I can’t find a way to embed the Yahoo! video, probably for complicated rich money corporation reasons, so if you want to see the most expensive Thanksgiving dinner in history, you’ll have to click through. But if rage has seeped through your fingers into your computer/phone and paralyzed both you and your browser, then read on. Old Homestead, a steakhouse in New York City, last year sold four $76,000 dinners, but the poors who ate that bargain meal may be forced to dream of this year’s edition. The 150-year-old steakhouse’s $150,000 feast, which can feed up to 12 assholes, includes a “$135-per-pound free-range, organic turkey sprinkled with gold flakes” which is stuffed with the keys to a 2018 Maserati Levante. So far, they’ve sold only one of these meals. If you’d like to be the second person, be aware that they only take cash or a certified check.